Willie Maley was born in Newry, County Down in 1868, the son of a sergeant in the Royal North British Fusliiers. He was the third of four boys, his brothers being Charles, Tom and Alec. Twenty years later, the family had settled in Cathcart, on the south side of Glasgow where, one December evening in 1887, three men involved in the development of a new football team called Celtic in the East End of Glasgow – John Glass, Pat Welsh and Brother Walfrid – came to the house to see if Tom Maley, who by then had played a few matches for Hibs, would care to join them. Tom was not in but Willie Maley promised to pass on the information to his brother. Just as the men were leaving, though, they suggested that Willie himself might like to come along to a training session. Never was a simple suggestion more amply rewarded with success. Willie Maly signed for the new club in May 1888, played in the first-ever match against Rangers Swifts on the 28th May 1888 and was a regular in the side for the ensuing seven years, picking up three league title wins – 1892/93, 1893/94, 1895/96; a Scottish Cup medal in 1892; plus four Glasgow Cup and five Charity Cup medals. He became player/secretary of the club in 1894, then moved up to secretary/manager in April 1897, a position he would hold for the following 43 years, until his retirement in 1940. During those years, Celtic won 16 league championships – 1897/98, 1904/05, 1905/06, 1906/07, 1907/08, 1908/09, 1909/10, 1913/14, 1914/15, 1915/16, 1916/17, 1918/19, 1921/22, 1925/26, 1935/36 and 1937/38 – 14 Scottish Cups – 1899, 1900, 1904, 1907, 1908, 1911, 1912, 1914, 1923, 1925, 1927, 1931, 1933 and 1937- 14 Glasgow Cups, 17 Charity Cups, the 1902 Glasgow Exhibition Cup and the 1938 Empire Exhibition Trophy. 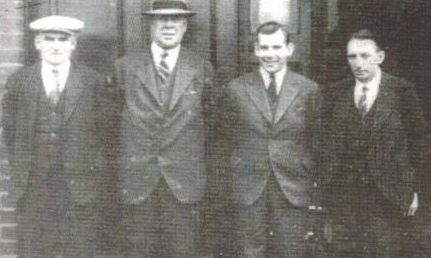 After his retirement in 1940, the result of some disagreements with the Board, little is known of Willie Maley’s subsequent life and he kept a very low profile. On 10th August 1953, he came back to Celtic Park for the first time since leaving to attend a match between Celtic and a Bohemians Select. This was ostensibly in aid of the ‘Willie Maley Testimonial Fund’ although the proceeds went to the Grampian sanatorium in Kingussie. On this day in 1958, Willie Maley died in a nursing home at 32 Mansion House Road, Glasgow. He was 90 years of age.